Please enjoy last post with out AMAZING and incredibly talented September Guest Designer for Butterfly Reflections Ink: Lysa Rohrer! Her coloring of these amazing kiddos really brought them to life!! Enjoy and please leave a comment telling Lysa how much you ADORE her!! Hello! Lysa here again with you today for my final guest DT post. 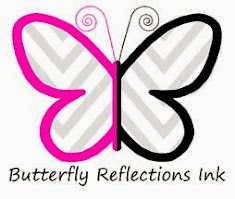 But first, big HUGE thanks to Vanessa and the Butterfly Reflections, Ink team for allowing me to join them for the month! Now, onto my card... I decided since this weekend was the start of the next Fall Coffee Lovers blog hop that I would play along! I had been eyeing these sweet Neat & Tangled sets, and finally got my hands on them- Big Bold Brew & Say Yes to Donuts! I stamped and masked the boy & the big mug (where can I find a mug that size?!) using my Mini MISTI, then stamped the girl so the donut was just slightly behind coffee cup, colored them with Copic markers, added some stickles for the sprinkles, and fussy cut the image out. I went through my stash of scraps of patterned paper and found a few coordinating prints and adhered them in the bottom corner, added the stamped images on foam tape, heat embossed the sentiment, and finished off my card by adding faux stitching around the card, and on some of the patterned papers. This is super adorable! What a great design! Thanks for being a sponsor for the Altenew Coffee Blog Hop, for the inspiration from your adorable card, and for the opportunity to win! Terrific coffee card ready for the 2016 Fall Coffee Lovers' blog hop! I think I like the thought of having a mug and donut that big but you know my tummy won't be able to fit it!!! Thank you for being a super sponsor too! !